A true survivor in the web hosting game, FatCow has been around through two dot-com crashes and a recession and is still selling web hosting space like it was going out of style. For more than 10 years, FatCow has been providing one of the premiere one size fits all hosting packages on the world wide web. FatCow is also a 100% wind powered web hosting provider, meaning your website has zero impact on the environment. FatCow has every single feature you could possible look for in a hosting provider so if you’re looking for a webhost that has everything you could ever need in one package, look no further than FatCow. 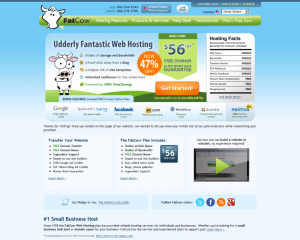 65% Off your Web Hosting with FatCow. Hurry, Sale Ends Soon! No Coupon Required! Currently the cheapest web host in the Host-Finder.net index, FatCow is clearly the most affordable choice. Clocking in at an extremely reasonable $3.15 per month, a FatCow plan will cost your company less than $40.00 per year to host your website. That’s a rate even the barest of budgets is sure to be able to afford. So, even if your company is on a tight budget in the beginning, FatCow offers an affordable option with plenty of power. In terms of features, FatCow is stacked to the max. Whether you’re site needs PHP, Python, Perl, or even Ruby, FatCow has the tools you need to launch your site. While it would be nice to see some support for PostGreSQL databases, virtually every other feature a person could possibly want is readily available in the FatCow plan. Performance wise, FatCow is one of the best sites listed in our index. In addition to the 99.99% uptime guarantee, FatCow provides a fully load balanced platform that can easily spread the traffic on days of high activity. In addition, FatCow provides daily server backups and has a diesel powered generator system to protect your data in the event of a power failure. In terms of customer support, the “moo crew” has one of the best setups available. FatCow offers 24/7 Phone, Email, and Live Chat. They also offer an online community forum, and a comprehensive online knowledge base. Taking it even one step further FatCow adheres to a separate code of conduct known as the Heifercratic Oath, which goes above and beyond standard support with items such as an average of < 2 minute wait on phone calls, firm deadlines on follow ups, and a guarantee to remain courteous and friendly during all support. Really, what more could you ask for? By using the industry standard cPanel interface, FatCow makes it very easy for people already familiar with web hosting to transfer their existing site to FatCow. If you’re starting a new site, FatCow provides dozens of one-click install applications such as WordPress, Gallery 2, and phpBB that can get you up and running with a website in seconds. Overall, FatCow is a vastly superior offering in comparison to most of the web hosting providers listed in our index. From the comprehensive list of features to the absolutely impressive customer support and performance, FatCow is a one size fits all web host that you’d have a hard time matching anywhere else on the web. So whether you’re looking for hosting for your small business or just for your personal site, we highly recommend FatCow for all your web hosting requirements.